2 Bedroom Flat For Sale in London for Asking Price £410,000. 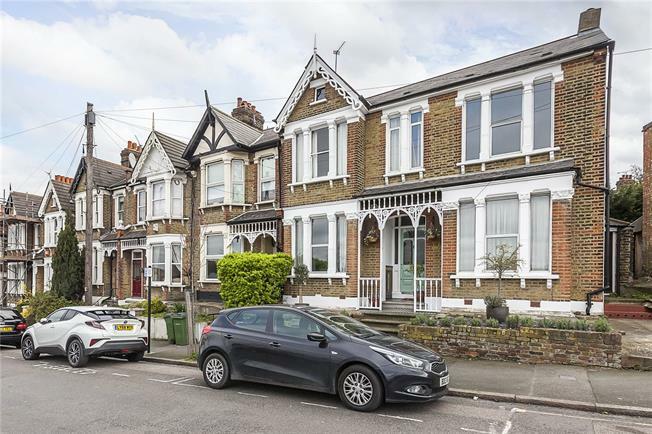 This attractive Edwardian double-fronted maisonette has plenty of kerb appeal with its elegant porch, checkered tile floor, large bay windows and pretty stained glass front door. Occupying the whole of the ground floor, the property is in very good condition and has been tastefully decorated and refurbished in recent years by the owner. A pleasant private entrance hallway leads to two double bedrooms at the front, and a living room, kitchen and bathroom to the rear. French doors open out from the living room onto a neat private landscaped patio garden. The property retains many period features, such as tiled fireplaces, curved walls and high ceilings, and the owner has also fitted cast iron radiators, double glazing, and a contemporary solid ash wood floor. The designer kitchen, with built in appliances, and stylish tiled bathroom are both modern and finished to a high standard. Eastcombe Avenue is conveniently located for the various independent shops, popular cafés and Marks & Spencer Food Hall at Blackheath Standard. Further to these amenities, a stroll across the heath will bring you to Blackheath Village with its array of shops, bars and restaurants. Westcombe Park station is approximately half a mile away and offers regular services into the city. A direct bus route also provides access to North Greenwich for the Jubilee Line. Finally, the beautiful Royal Greenwich Park is easily accessible to the West. There are also a number of outstanding schools close by.